I was fortunate enough to go on one of the perfume tours organised by Pia (of the blog Volatile Fiction) two years ago and once again a group of us (Pia, her husband Timo, Sarah, Irum, Nick, Ella and myself) gathered for a full day of fragrant fun on an unseasonably hot and humid day in the capital. 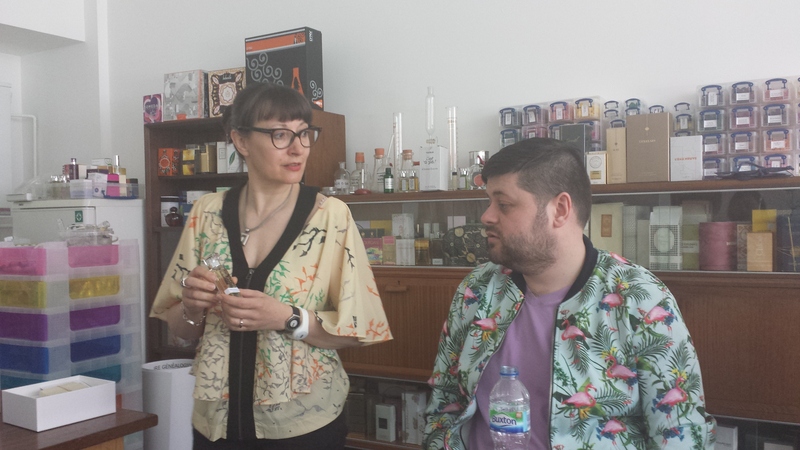 We began our sensorial adventure at 11am at Sarah McCartney’s 4160 Tuesdays perfume studio in Acton, west London. 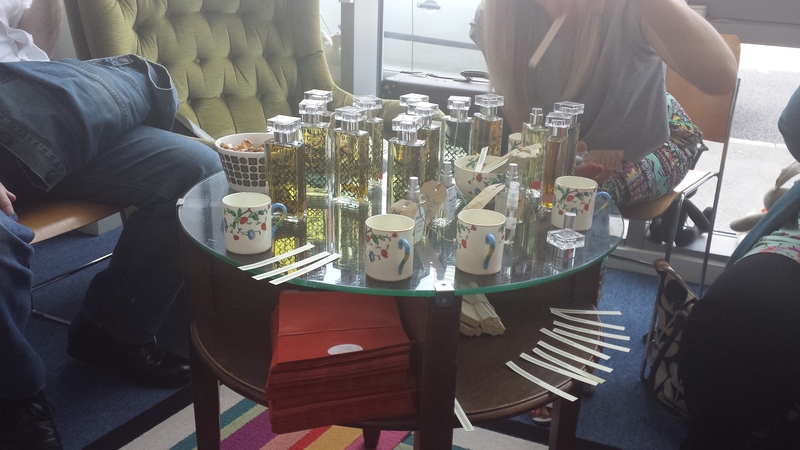 We started off downstairs with Guerlain’s L’Heure Bleue scented tea from Paris (naturellement) in 1930s tea-cups and chatted over some blotters sprayed with Sarah’s latest creations. These included a fragrance Sarah made for an event at the London Transport Museum named Goodbye Piccadilly. It’s vintage in style and was inspired by Sarah’s grandmother who was a clippy (conductor) on the London trams. Pia was so enamoured with it she left with a 30ml bottle. 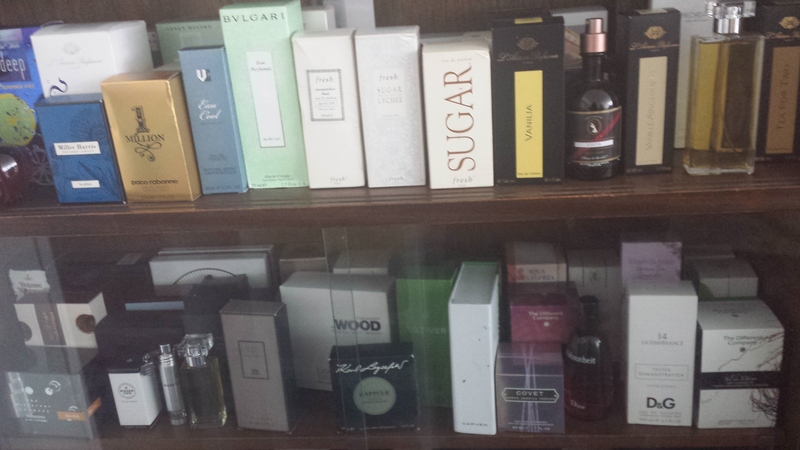 Then we moved upstairs where Sarah shared some highlights from her magnificent “Wall of Scent”. 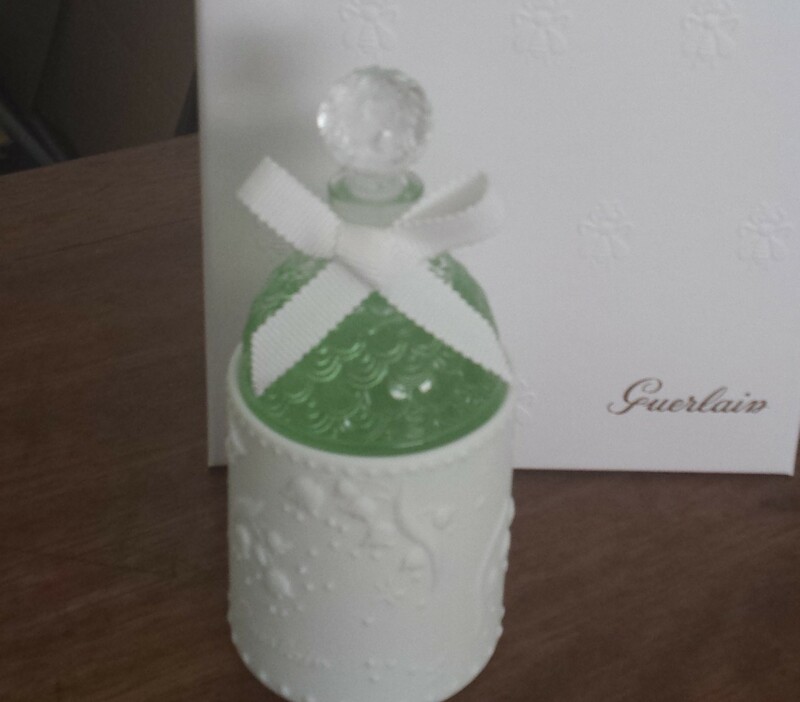 She showed us this year’s limited edition Muguet from Guerlain which comes with an elegant porcelain holder. The fact that we all drooled over it was hilarious considering we’d been bemoaning people’s infatuation with expensive perfume packaging not 5 minutes previous. Like me, Sarah has never been much of a fan of lily of the valley scents but we’d both very happily wear this one. From her vintage collection we sampled Coty’s L’Aimant (which was gorgeous and bore little relation to the cheapened version available today) and 1930s L’Heure Bleue. Back up to date, was the much more recent release from Guerlain of L’Heure de Nuit (beautiful blue juice in a Bee bottle!) which is a brighter version of L’Heure Bleue. While it may be sacrilegious to say so, it was a lot more to my taste than the original. 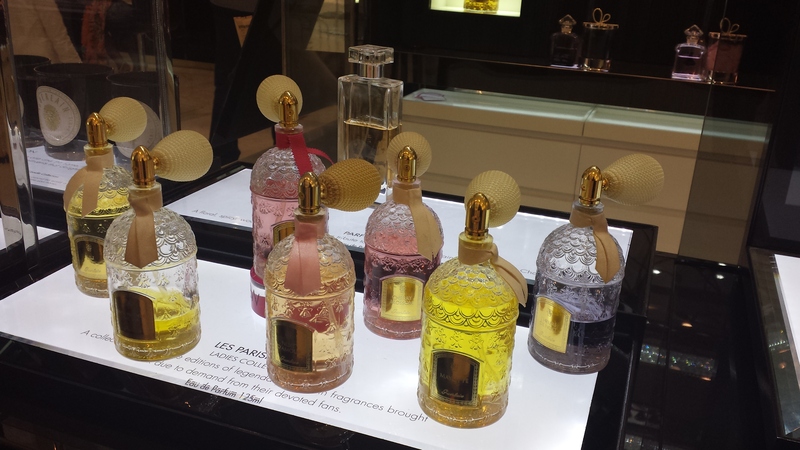 Also from Guerlain was Mon Precieux Nectar which Irum and Pia both fell for in a big way. Sarah told us that this was their update on the glorious but discontinued Guet-Apens/Attrape-Coeur, which we then tried in order to compare the two. I thought there would be little resemblance and so it proved. Guet-Apens is a boozy, violet inflected amber whereas Mon Precieux Nectar is a honeyed almond vanilla. Of course we got to try quite a few from 4160 Tuesdays including The Sexiest Scent on the Planet. Ever (IMHO), Says Alice, Shazam! and The Dark Heart of Old Havana. The last of these I tried on skin and it proved to be a unique sugar coated tobacco. A particular perfumista favourite is The Lion Cupboard which is inspired by the carved cabinet where Sarah’s father kept his gloves, hats and scarves. If anyone can come up with quirkier, more humorous perfume names than Sarah I’d like to know who they are. Before we knew it, it was time to head off for our lunch reservation at “the Queen’s grocers” Fortnum and Mason on Piccadilly. We had a table booked in The Parlour restaurant and it was a lot of fun. Everyone got to indulge their extravagant side. I applaud Nick for his lunch choice of Gin & Tonic Sorbet, two types of strudel, Coke Float and three scoops of ice-cream (pistachio, strawberry & balsamic vinegar and salted caramel). 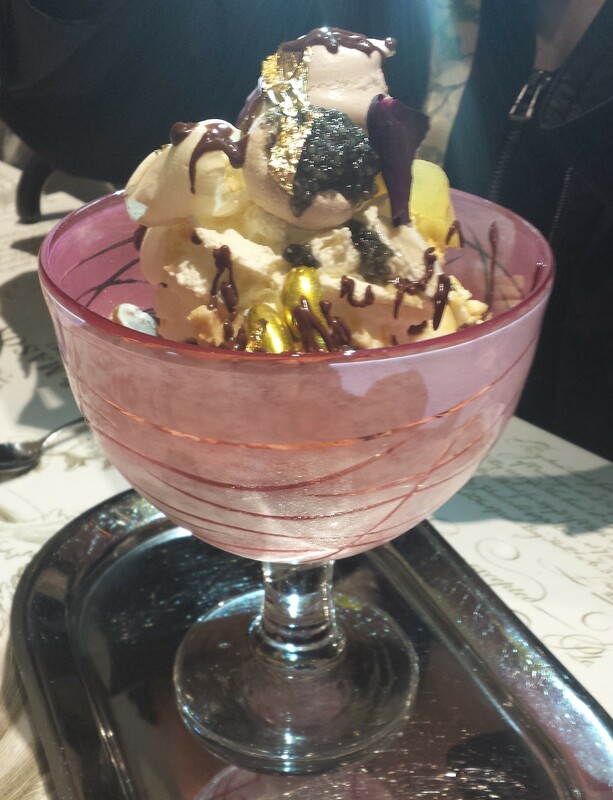 Sarah out did us all however with the Ultimate White Chocolate Gold ice-cream sundae topped with gold leaf and Sevruga caviar. This day was meant to be a special treat and we acted accordingly. 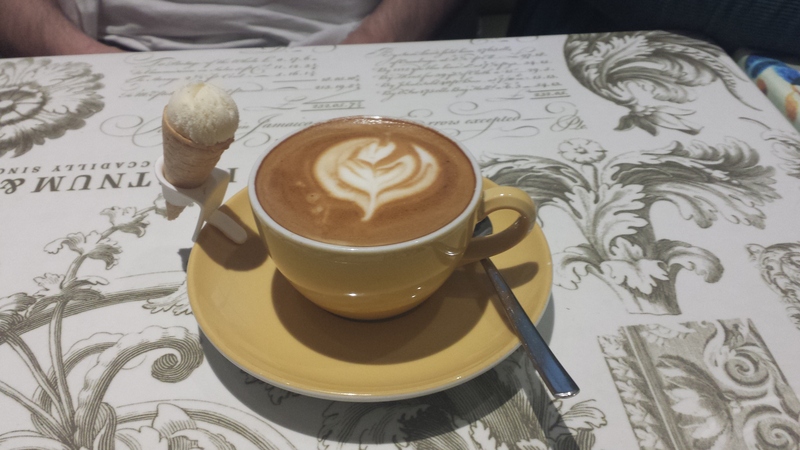 Even the coffee came with a mini ice cream cone. After lunch we had a wander around the second floor perfumerie. The brands there are numerous but include Clive Christian, SoOud, Nasomatto, Maison Francis Kurkdjian, Juliette Has a Gun, Caron, Grossmith, Atelier Cologne, Xerjoff and Piguet. We happened to bump into Amanda Brooke from Grossmith who stopped for a chat. Sarah McCartney bought a bottle of Dior’s Forever and Ever which is a very pretty, summery rose. Ella purchased a bottle of Brigitte by Tocca which is a happy concoction of rhubarb, papaya, ginger, iris, rose, saffron, sandalwood and musk. She also tried Mistral Patchouli by Atelier Cologne on my recommendation because she’s looking for a patchouli suitable for holidays. Some of us parted ways at this point, while those remaining headed off to Selfridges on Oxford Street. 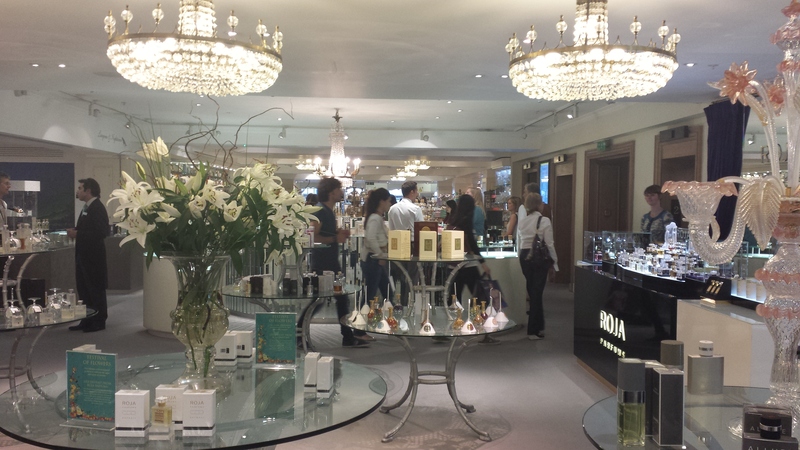 Pia and Irum are both make-up fanatics so we had a browse around the packed counters in the Beauty Hall. They rate the new formulation of Bobbi Brown’s Foundation Stick and Pia – a trained make-up artist – recommended Mac’s Prep + Prime Transparent Finishing Powder. Both go on to my cosmetics Wish List. 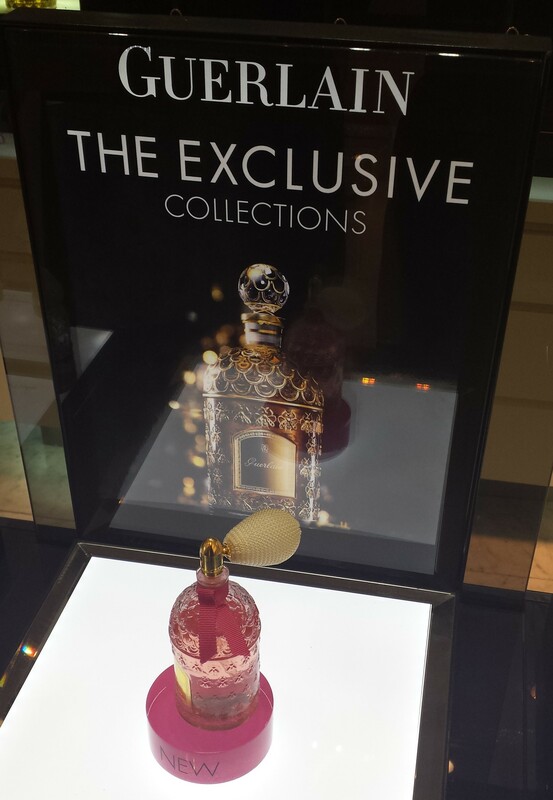 At the Guerlain fragrance counter I tried the exclusive Mademoiselle Guerlain which is actually a re-branding of La Petite Robe Noire 2. The pink coloured juice is perhaps unsurprisingly, a very lightweight confection. Pia pondered over Cuir Beluga (fluffy vanilla suede) and Mon Precieux Nectar but went for Aqua Allegoria Nerolia Bianca in the end which is lovely and positively a steal by comparison. I sprayed Spiritueuse Double Vanille on skin for the umpteenth time and really should have bought a bottle. 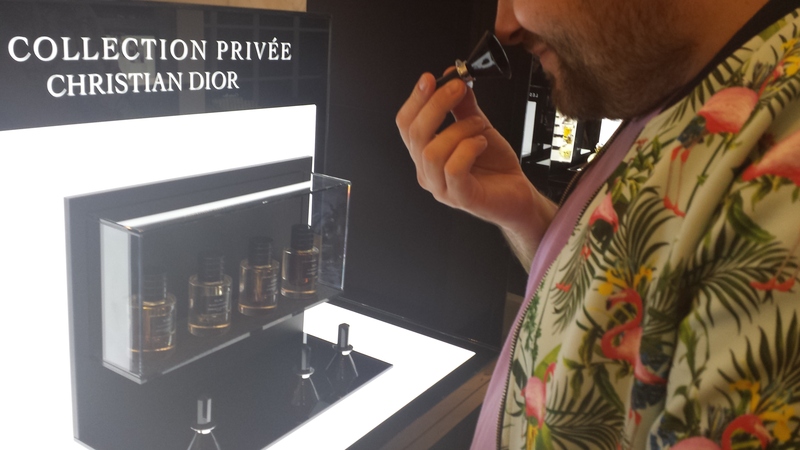 Nick and I went to the Dior fragrance boutique where we sampled the new Cuir Cannage in La Collection Privee. It’s an extremely well done iris leather and very much as Nick described it: “Expensive handbag”. Annoyingly there were no samples. 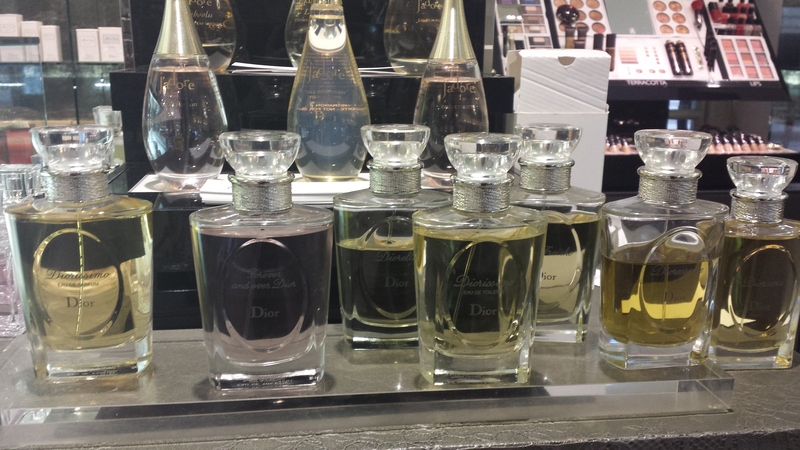 We also sniffed Dior’s ridiculously expensive Les Elixirs Precieux which are perfume oils intended for layering with their fragrances. The Ambre was the best of the four for me but Nick loved the Musc which he thought was pissy in a really great way(!). 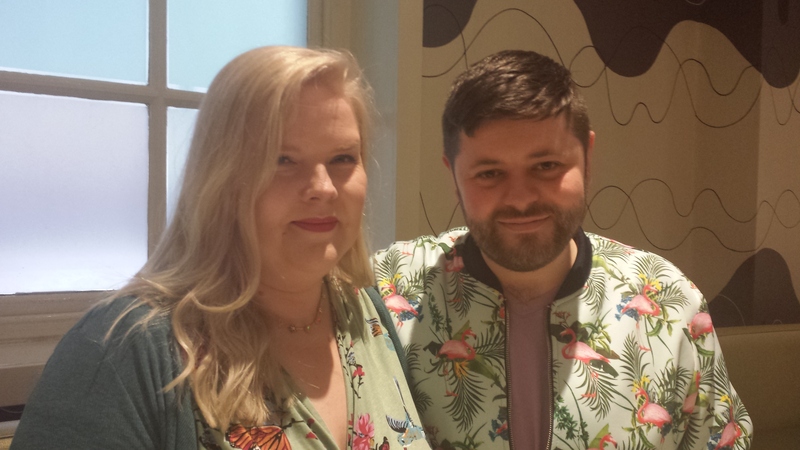 I went on alone to Les Senteurs at Seymore Place where I caught up with SAs Lauin and Callum and tried the two new additions to Atelier Cologne’s Precieux Metal collection, Blanche Immortelle and Santal Carmin. Sadly these didn’t grab me on first sniff but I did get samples of the latest By Kilian’s, Imperial Tea and Sacred Wood which I have high hopes for. There, at nearly 7pm, my fragrant and fabulous day came to a close. Many thanks to Pia for organising such a great day out and to Sarah for hosting us at 4160 Tuesdays HQ. Have you taken part in a similar fragrant gathering? Would it be possible to organise one in your area? This entry was posted in By Tara, Travels and tagged Dior, Fortnum & Mason, Fragrance, Guerlain, Les Senteurs, London, Perfume, Selfridges. Bookmark the permalink. You would have been very welcome! Sorry a get together in your area is not feasible, but acres of olive orchards sounds gorgeous. I do need to try mademoiselle guerlain, the way I remember ‘modele 2’ it didn’t really capture me the first time around. I actually preferred the original LPRN, and use my precious drops sparingly. Your meet-up sounded spectacular, thanks for taking us along. Asali, I must admit I didn’t get L’HB from the tea, not in terms of scent or flavour but maybe that’s just me. It was nice of Sarah to share it with us. Re SDV, I think I need to test Orchidee Vanille by Van Cleef & Arpels then I will know for certain and finally invest in a bottle of vanilla perfume. Mademoiselle Guerlain was pleasantly marshmallow-y but so flimsy, even after several sprays. Clearly they’re aiming it at very young women/girls. Glad you enjoyed coming along with us! I did stay at home and do housework – ironing!, gardening! – but what a treat I missed. Every stop on your itinerary was jampacked with amazing scents and flavours to try by the sound of things! And it is always fun to go sniffing with likeminded fumehead friends. The ice creams looked epic, I must say, and I am intrigued to learn that there is actually a tea infused with L’Heure Bleue. Mon Precieux Nectar is one of the few perfumes listed that I have tried, thanks to B, but it didn’t really work on me. So many other new Guerlains to try though. And make up! I am seriously behind the scented curve. 🙂 Oh, I did inherit some vintage L’Aimant, mind, which Sarah has tried and pronounced good gear! It was a fashion triumph and I loved “Le Jacket de Nick”! Mon Precieux Nectar is actually the only almondy perfume that really works for me and I thought it would for you too, given the vanilla, so that’s a shame. Well done on your vintage L’Aimant. It really did surprise how gorgeous it was. Wow – can you remember all of them? You know, I didn’t even include everything we tried. So much great stuff. This sounds like SUCH a fun day. With all the activities in London these days, it seems like everyone is getting their Tara time except me, and I don’t mind saying I am green with envy. 😦 But, as always, thank you for taking us along. Ha ha! It’s a wonder Nick in particular isn’t sick of the sight of me by now. There’s been a string of fun gatherings lately and it’s Perfume Lovers London green perfumes evening tonight. I do feel lucky to be in London where there are so many events with lots of international perfume friends (like yourself!) visiting too. Thanks, Suzanne! It was a rather long post so I’m pleased to hear you got a kick out of some of the details. Sarah ate the whole thing so I presumed she enjoyed it. I have to be really careful about what I eat and drink so what Nick had really fascinated me. (I had a very unexciting but pleasant lunch of cured salmon sandwich, chocolate cake with vanilla ice-cream and a glass of water). Well remembered. Sunshine and Pancakes is exactly what it was called and Sarah’s fragrances are now available through LuckyScent, I believe. Off topic, did you decide on rhe pooch? Hope so! I wish I could have a dog for rent on the weekends. I think it’s the perfect solution. And that flamingo jacket !!!!!!! It does sound like a perfume marathon and that wasn’t even all of it! Somehow though – maybe because we changed locations a few times and had a long lunch break – it didn’t feel like too much. Nick’s jacket has caused quite the sensation! The Guerlain Muguet bottle is absolutely lovely ! It’s completely adorable and the nicest LotV I’ve come across. Thank you for the detailed and elegant write-up, Tara! Thank YOU Pia. Without your effort and initiative it wouldn’t have happened. We need more people like you in world, who make great things happen. Loved your take on the day too. The trip looks truly amazing. What a treat for the senses! I am very curious about Mademoiselle Guerlain. Its been on my “I-wish-I-can-sample-it” list since it’s launch. How does it compare to Mon Precieux Nectar (I adore this fragrance. I really regretted not getting a bottle when I had the chance in NY)? Yes, the whole day absotlutely was a treat for the senses! Mademoiselle Guerlain is very, very different to Mon Precieux Nectar. I much prefer the latter because it has more substance and vanilla. Mademoiselle Guerlain is much more fresh, pretty and girly with iris and marshmallow. Thomas, it was a day full of awesomeness! I really hope you will be with us next year.